The people’s representatives just keep getting richer, and doing so faster than the people represented. The cumulative net worth of senators and House members jumped by one-fifth in the two years before the start of this Congress, outperforming the typical American’s improved fortunes as well as the solid performance of investment markets during that time. The disparity becomes clear after examining the most recent financial disclosures of virtually every current lawmaker. The news is not likely to do them any good during a midterm campaign year when disapproval of Capitol Hill remains in record territory and sentiment remains strong that politicians in Washington are far too disconnected from the lives of their constituents. The total wealth of all current members was at least $2.43 billion when the 115th Congress began, 20 percent more than the collective riches of the previous Congress, a significant gain during a period when both the Dow Jones industrial average and Standard & Poor’s 500 index rose slightly less than 10 percent. Beyond that grand total, the median minimum net worth (meaning half are worth more, half less) of today’s senators and House members was $511,000 at the start of this Congress, an upward push of 16 percent over just two years — and quintuple the median net worth of an American household, which the Federal Reserve pegged at $97,300 in 2016. The financial disparity between those who try to govern and those who are governed is almost certainly even greater than that. Members of Congress are not required to make public the value of their residences and their contents, which are the principal assets of most Americans. Nor are they required to reveal their other assets and debts to the penny, or even close — instead using 11 broad categories of value (starting at less than $1,000 and topping out at $50 million or more) that do a comprehensive job of obscuring what each member is precisely worth. Erring on the conservative side, Roll Call estimates each member’s wealth by subtracting the minimum reported value of all immediate family liabilities from the minimum reported value of all assets. Notwithstanding the limits of the annual (and minimally policed) disclosure rules, it’s clear the Capitol remains as populated as ever with a disproportionate share of very well-heeled. Millionaire lawmakers have always been a part of the congressional story — from the landed gentry who created and first populated the legislative branch, through the industrialists who wielded outsize influence in the Gilded Age, to the corporate bosses and old money heirs who larded the cloakrooms through the end of the Cold War. What’s marked recent years, a time when wealth disparity has grown wider than ever in American history, is the arrival of so many of the superrich. For every 13 members, in fact, one may fairly be dubbed a “1 percenter,” the term of derision imposed by liberal groups on the richest 1 percent of Americans. Data from the Fed pegged the net worth threshold for these people at $10.4 million in 2016, a mark exceeded by 26 Republicans and 17 Democrats. 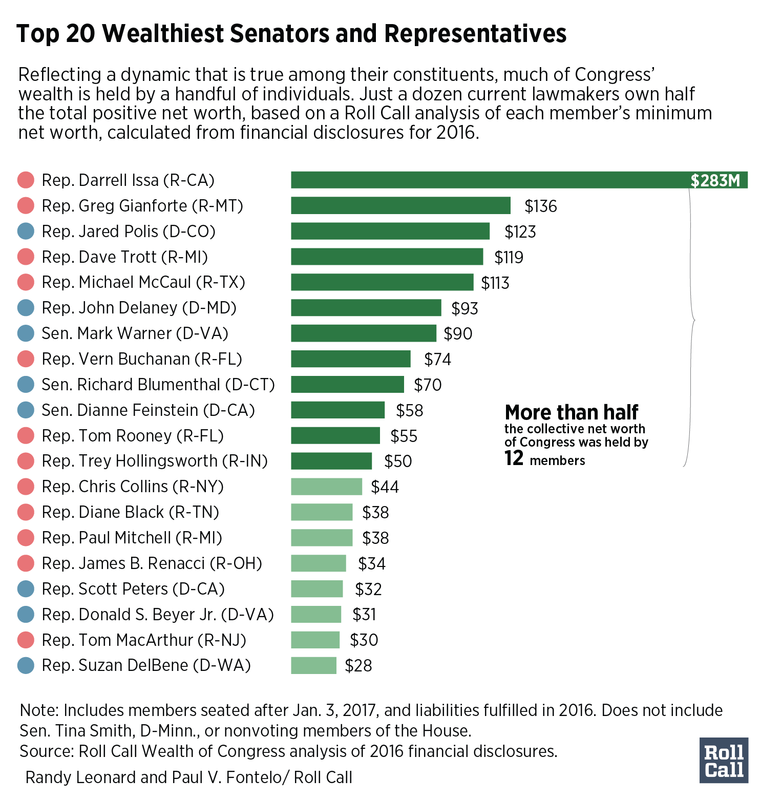 At the high end of that group are 10 House members and three senators worth more than $43 million, which the Fed calculates as the richest one-tenth of 1 percent of the population. Below this rung of the phenomenally prosperous is a thicker belt of the merely flush — the 153 House members (13 more than in the previous Congress) and 50 senators who are millionaires, at least on paper. This stands in contrast to the 7.4 percent of U.S. households that had amassed a net worth above $1 million in 2016, their home values included, according to the Spectrem Group investment research firm. 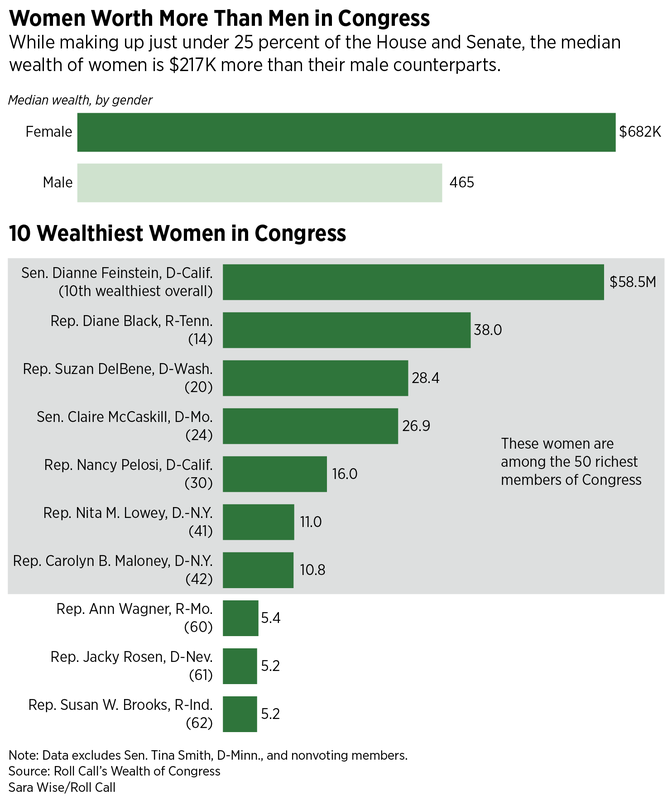 By coincidence, 38 percent of the women in Congress are millionaires — identical to the share of millionaires in the total membership. The congressional millionaire ranks skew old, reinforcing how many people enter politics only after they’ve assured themselves a solid financial footing. A little more than half of the five dozen lawmakers born before the end of World War II are worth more than $1 million, as are 43 percent of the Hill’s baby boomers or the five out of eight members born between 1946 and 1964. But among the quarter of the membership from Generation X and the handful of millennials, only one in five is a millionaire. 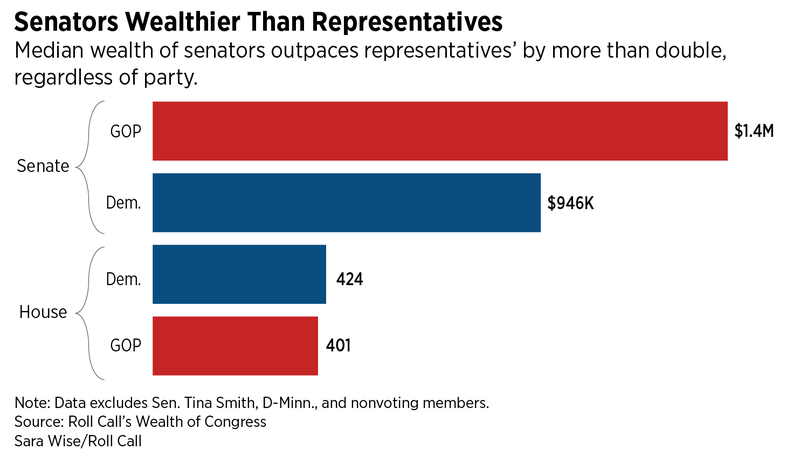 And in the middle are the “typical” members, with senators boasting a significantly better median net worth ($1.4 million for Republicans, $946,000 for Democrats) than House members, where the median figure for both caucuses is just north of $400,000. A very similar figure, $397,000, is the minimum net worth disclosed on the essentially identical form for 2016 filled out by Vice President Mike Pence, who spent a dozen years as a House member from Indiana. President Donald Trump’s most recent form, however, describes a chief executive far richer than anyone in the legislative branch — worth at least $1.1 billion at the time of his election. As in the past, the ranks of the congressional 50 richest are studded with some of the Hill’s most influential players: Senate GOP leader Mitch McConnell of Kentucky and House Democratic leader Nancy Pelosi of California, for starters, plus the Republican chairmen of eight congressional committees along with the ranking Democrats on four panels. And 10 of the 50 richest, six of them majority Republicans, sit on House Ways and Means or Senate Finance, the committees in charge of drafting the package of tax cuts and tax code changes that were enacted at the end of last year and targeted to benefit the richest Americans most of all. One thing that’s different about the current 50 richest list is how much of it is guaranteed to change in 2019. Not only will the freshman class elected in November surely include some very wealthy people, but also nine of the richest current members have decided they are not staying in Congress beyond this fall. Underscoring how much wealth is concentrated in a tiny pinnacle of the population, in Congress as well as the country, these voluntary departures include four of the six richest members, all from the House, whose immense fortunes combine for an astonishing one-quarter of the entire net worth of Congress. Republican Darrell Issa, whose Viper car alarm business has made him the richest member of Congress throughout the decade (a net worth of at least $283 million in 2016), says he’s not running for a 10th term in Southern California; Democrat Jared Polis, who sold an online greeting card businesses and then made a killing in other internet startups, is running for governor of Colorado; Dave Trott of Michigan, who created a behemoth in the home foreclosure industry, is leaving after just two terms as a frustrated GOP moderate in an ultra-conservative caucus; and venture capitalist John Delaney is giving up his Maryland seat to ready a long-shot bid for the 2020 Democratic presidential nomination. All four are self-made, which is the most typical route for joining the 50 richest. Almost three-fifths of them (22 Republicans and 7 Democrats) are multimillionaires thanks to their own business acumen, in a wide array of industries including software development, banking, telecommunications, health care, insurance, real estate, litigation, plastics and car dealerships. Three Republicans and nine Democrats, five women and seven men, mainly have spouses to thank for their impressive wealth. Most prominent among them are McConnell (Transportation Secretary Elaine Chao’s parents were big-time Chinese goods importers), Pelosi (Paul Pelosi owns a real estate and venture capital investment firm) and GOP Sen. John McCain (Cindy McCain now has a controlling interest in her father’s beer and soda distributor, the biggest in Arizona). Just nine lawmakers made the list principally because of inherited money. That roster is about half the size of a dozen years before, not so much because trust funders have fled Congress but because much of their wealth is now exceeded by that of new money entrepreneurs. The most newly prominent member on the list is Rep. Joseph P. Kennedy III of Massachusetts, who gave the Democratic response to the State of the Union address in January, thanks to his family inheritances. Six among the 50 richest are in their first congressional terms, all in the House. Greg Gianforte, who sold his customer relations software business to Oracle in 2011, arrived after a May special election to become the second richest member of this Congress, with a net worth of at least $136 million. He’s joined by fellow GOP self-made multimillionaires Paul Mitchell of Michigan, who ran a workforce retraining company, and Ralph Norman of South Carolina, a major real estate developer. Rounding out this list are Trey Hollingsworth of Indiana, heir apparent to a multistate industrial real estate empire; fellow Republican Francis Rooney of Florida, who inherited the family construction business; and California Democrat Ro Khanna, who made the roster because his wife, Ritu, has benefited from the killing her father made as a distributor of auto transmission replacement parts. Khanna is the only one of the group who did not invest significant amounts of family money in his own campaign. The son of Indian immigrants, he’s also the only nonwhite person among the 50 richest in a Congress where one-fifth of the members are ethnic or racial minorities. Altogether, Republicans have 64 percent of all the wealth in the 115th Congress even though they hold only 54 percent of the seats. Paul V. Fontelo was the principal researcher for this project.